Agatha Crusty (pronounced Croosty) is a crime novelist. She's also pretty adept at solving crimes. 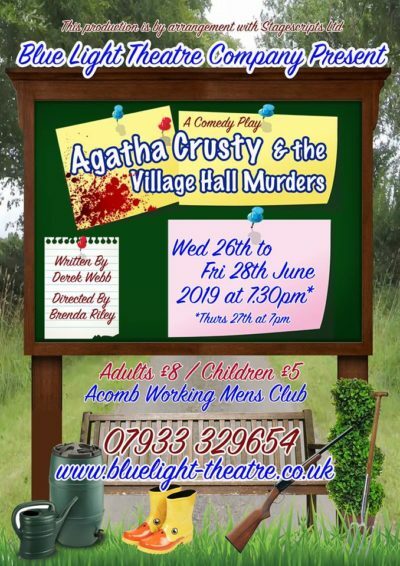 And when her sister-in-law Alice invites her to spend a few days with her in the village of Chortelby, it's not long before she gets caught up in a series of murders which seem directed at members of the All Saints Village Hall committee. From Toby, the Vicar, and Eleanor, Chair of the committee, to Harry Knott the caretaker and identical twins Olivia and Oliver Truscott-Pratt, there are plenty of suspects. And with an investigating officer as incompetent as D.I. Twigg, there are plenty of laughs as the murders begin to pile up. But, while packed full of wit and very funny scenes, this is also a genuine murder mystery with an ingenious plot which will tax the little grey cells of the audience at the same time! 'Agatha Crusty And The Village Hall Murders' has already had more than seventy productions, and hundreds of performances, in the UK, Australia and the US. Without exception, audiences have loved it and the cast and crew too. Fill in the form below to receive the latest information for shows and news. We will not share your information with any third party companies. Your privacy is important to us.